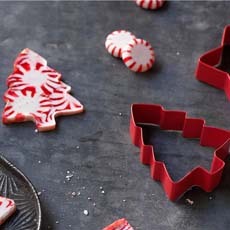 Use your holiday cookie cutters to make these fun mint shapes from conventional peppermint candies. Photos courtesy Reynolds Kitchens. We love the recipe developers at Reynolds Kitchen, who often surprise us with their creativity. Just by looking at the photos, you can see what they’ve done with an everyday bag of striped peppermint candies. The result is like candy canes, but as Elle Woods would say, the shape is more funner. It’s also funner to make them with mints in both holiday colors, red and green. 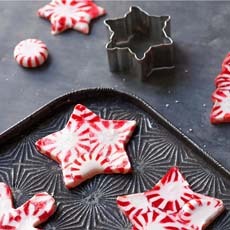 Brach’s makes their striped Starbrite Mints in both colors, as well as a sugar-free red and white mint*. We’d suggest making them as tree ornaments, but can’t figure out how to affix something so that they hang evenly. We tried making holes with an ice pick before the shapes fully hardened, but it wasn’t neat. Ribbon didn’t stick to the peppermint with the glues we had at hand. 1. PREHEAT the oven to 350°F. Line a cookie sheet with Reynolds Parchment Paper. 2. SPRAY oven-safe, metal cookie cutters with non-stick cooking spray, then place on the cookie sheet. Fill each cookie cutter with peppermint candies. Break the candies into smaller pieces to fill in the smaller areas of the mold (we used a meat mallet). 3. BAKE for 3–9 minutes until the candies melt into cookie cutter shapes. Remove the sheet from the oven and let the candy harden. Stretch the cookie cutter a bit to remove the candy. This concept works for Valentine’s Day, too. Collect a bunch of heart-shaped cookie cutters. *We haven’t tested the recipe with sugar-free mints, but guess that they’ll melt in a similar fashion to the conventional variety.